This time of year has farmers’ markets and grocery stores overflowing with fresh, locally-grown produce. And one summer fruit in particular, backed by science, comes with good news for your heart. Spit those seeds, please! Researchers from Florida State University found that eating watermelon had the potential to cut blood pressure in overweight people, even when they were under stress. The study, published in the American Journal of Hypertension, started out with a statistic showing that more people die of heart attacks in the colder seasons than in warmer ones. That happens because the chilly weather increases blood pressure, in turn upping the work required by the heart to pump blood into the aorta. The result is less blood flowing to the heart, which means obese people with high blood pressure are at higher risk for heart attacks and strokes in colder weather or when they’re otherwise exposed to cold temperatures. Most North Americans live somewhere where the weather is cold for at least some part of the year, so what can we do to lower our risk of a dangerous cardiac event? Aside from the conventional ways to reduce risk, like losing weight and exercising, choosing good foods for your heart can also be part of your strategy to keep your ticker healthy. Now watermelon could be one of those good foods. The new study involved 13 patients who were middle-aged and obese—and who had high blood pressure. The patients were exposed to cold temperatures meant to simulate those you might encounter during the winter months by having one hand placed in water kept at a temperature of 39 degrees Fahrenheit, just above freezing. While the subject’s hand was in the water, the research team measured vitals like blood pressure. Meanwhile, the group was split in two. Half were given two amino acids, L-citrulline and L-arginine (from watermelon extract) each day, while the second group received a placebo. After the first six weeks, the groups were switched for the second half of the experiment. The research subjects were also told not to take any blood pressure medications during the study and instructed not to make any significant lifestyle changes—particularly not any related to diet or exercise. Figueroa’s findings aren’t the first time he’s investigated the ways in which watermelon might be on that list of good foods for your heart. He’s also looked at how the fruit affects post-menopausal women and adults with pre-hypertension for the better. 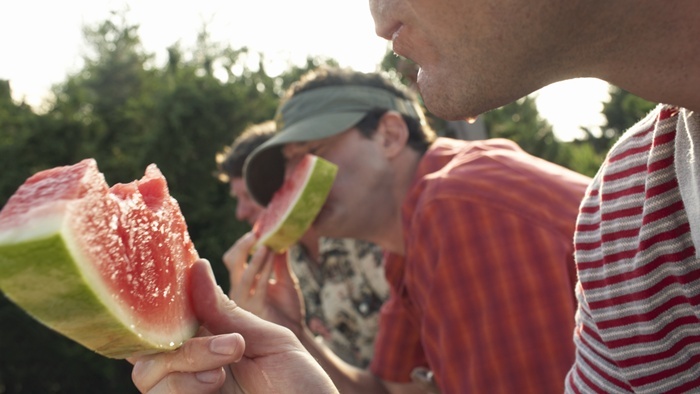 All the more reason to bite into some refreshing watermelon this summer! Jargin, S.V., “Food contamination after the Chernobyl accident: dose assessments and health effects,” International Journal of Low Radiation, 2013. Figueroa, A., “Effects of Watermelon Supplementation on Aortic Blood Pressure and Wave Reflection in Individuals With Prehypertension: A Pilot Study,” American Journal of Hypertension 2010; doi: 10.1038/ajh.2010.142.